In the children’s story The Little Engine That Could, a train engine pulling a load of toys breaks down at the bottom of a mountain with no power to make it to the top. The sad engine’s spirits dip with each passing engine that refuses to help because they are “too important” or “too tired” or it’s “not my job.” Only a little blue engine stops to help. Chanting “I think I can, I think I can!” the Little Engine is able to crest the mountain and bring toys to the children. “I think I can” describes the mindset of communities and organizations in our region to develop literacy programs. When our 10 Early Childhood Initiative (ECI) coalitions surveyed communities about early childhood issues, they made the startling discovery that too many children did not have access to books, or didn’t have adults read with them. It could seem like a daunting task, but people and organizations stepped up to the challenge to expand access to reading. I think I can! Coincidentally, The Little Engine That Could is the first title children receive when they join Dolly Parton’s The Imagination Library, which is offered in several of the counties in our region. This program delivers a book in the mail each month for participating children, up to their fifth birthday. I think I can! Crates of books have cropped up in Grant and Otter Tail County communities in locations where children often need to wait. I think I can! Southern Valley ECI (Wilkin County) is working with parents and child care providers on decreasing screen time and increasing read time. I think I can! Traverse County ECI continues to support the library’s Saturday Story Hour, something that was missing for several years in their community. I think I can! Prescription for Reading and Reach Out and Read are book distribution programs where a trained doctor or nurse gives children books during their well-child exams. Hidden in this pleasant gesture is the medical professional’s observation of how the children interact with the book and if there is a concern about a child’s development. I think I can! Partnering with the local Kiwanis groups, the Becker County ECI—and soon Otter Tail and Stevens County ECIs—are offering the “Today’s Readers, Tomorrow’s Leaders” program where Kiwanis members read to children in child care settings, with each child receiving a copy of the book. I think I can! Two Traveling Treehouse mobile learning buses make their way through Douglas and Pope Counties, bringing literacy programming and books to children in remote areas. I think I can! 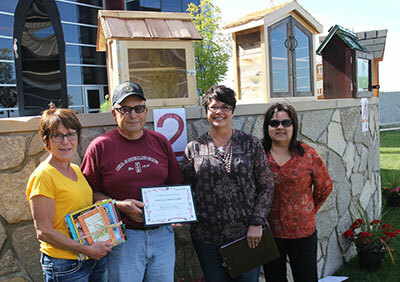 Both Clay County and White Earth ECI have initiated “Free Little Libraries” in several neighborhoods, and White Earth has received a large grant to purchase books plus a library furniture donation from a local college to open a new public library. Like the Little Engine, perseverance pays off and, through a book- by-book approach, the ECIs have developed and partnered to bring the joy of reading to thousands of children. Each project adds another component to build a system that teaches the importance of literacy and the joy of reading to all children.